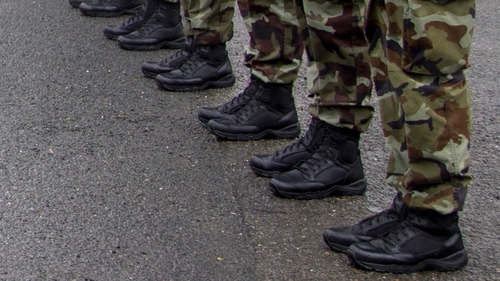 Irish authorities are investigating if a former member of the Defence Forces has been arrested in Syria for alleged membership of Islamic State. The Department of Foreign Affairs has confirmed that an Irish citizen is being detained in Syria. RTÉ News has learned that the person being detained is a woman, but her identity has not been confirmed. The Government, gardaí and the Defence Forces are aware that a former female member of the Defence Forces travelled to Syria around three years ago. The woman, who held the rank of private, left the Defence Forces around eight years ago and was subsequently radicalised. It is understood the woman was from the northeast of the country and gave birth to a child in Syria. There are reports tonight that the woman being detained in Syria over alleged membership of ISIS is the former member of the Defence Forces, but this has not been confirmed. Gardaí and the Defence Forces are working to confirm the person's identity. Both authorities are awaiting further information and will require a name and passport information in order confirm her identity. They are also trying to verify reports that the woman was detained at an airport. The Department of Foreign affairs says it provides consular assistance to all Irish citizens abroad, but it is not clear if this woman has sought assistance from the Irish or other authorities.